bien travaillé, ç'est mon cochon." Olivier Hélibert is one of those people who has known, since he was three years old, exactly what he wants to do in life. 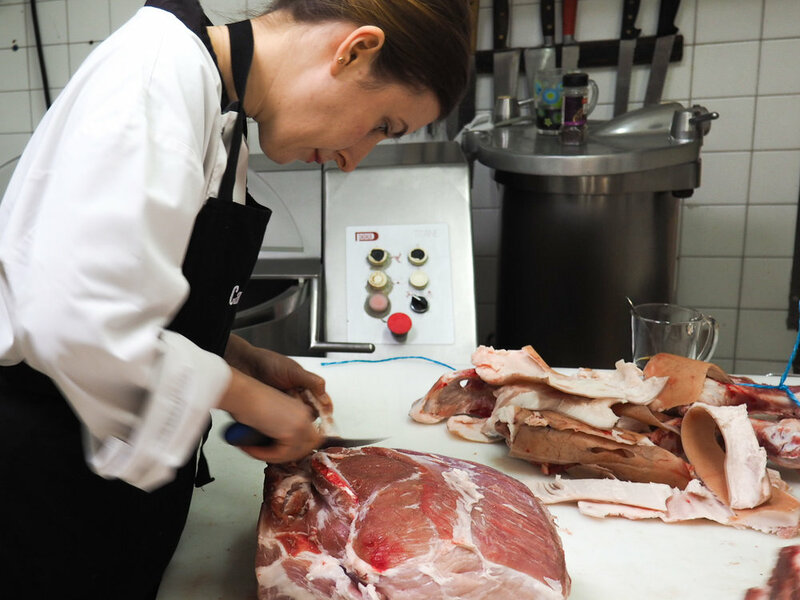 Be a charcutier! 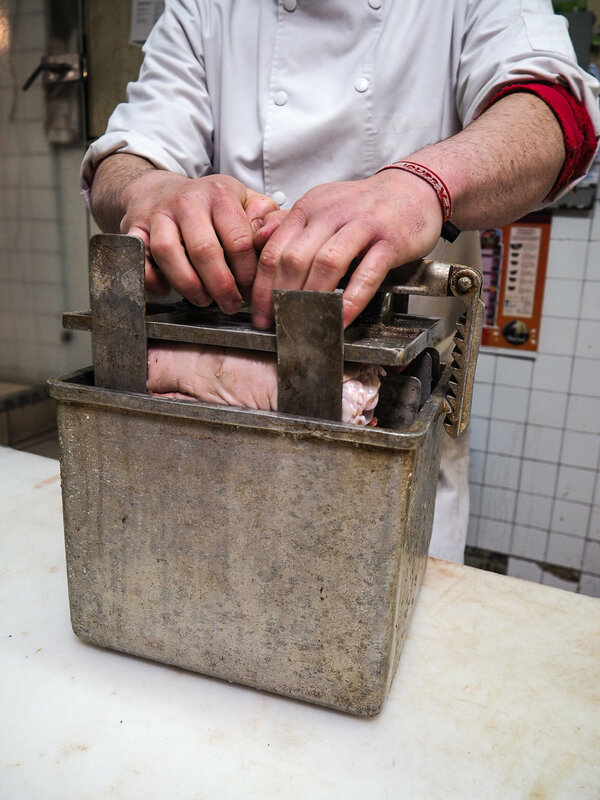 Not to be confused with "butcher," a charcutier works mostly with pork products and are masters at transforming this tender meat into the likes of pâtés and terrines, raw, cured or smoked sausages, and even the likes of trotters or snouts. 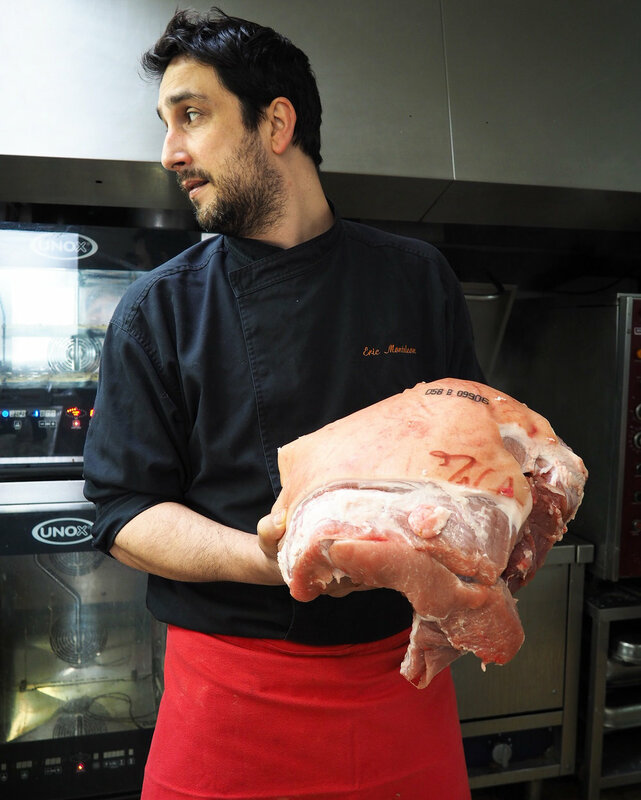 Olivier only works with Breton-raised pigs, who are well-fed and well-raised, slaughtered close to their farm, and transported directly to the charcuterie. Talk about short circuit distribution! 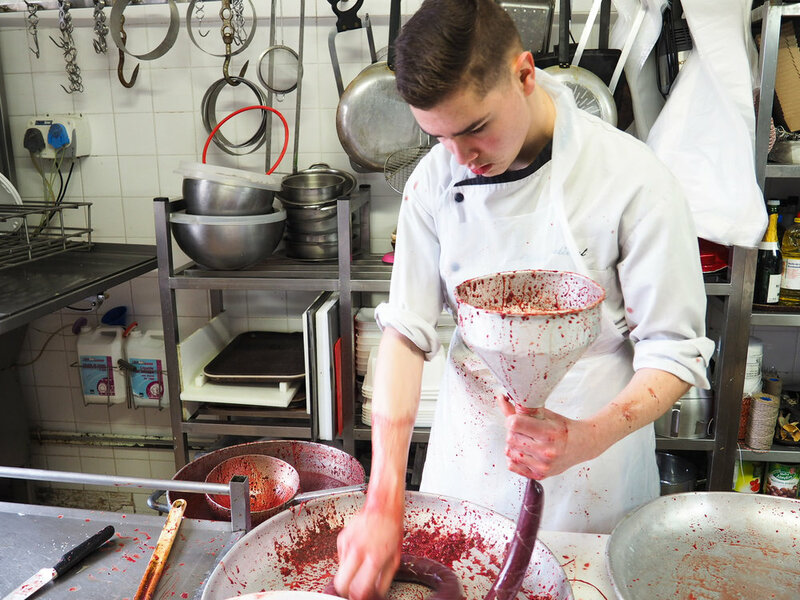 Olivier completed his charcutier diploma in 1988, in Brest, and then dabbled a bit in kitchens across the country. He gave cooking classes, as well, and his pedagogical demeanour shows when he's training his young stagiaires. At the age of 28, he returned to his first love: pork. Because the bank would not grant Olivier and his wife, Christine, a loan, they struck out on their own and found an old charcuterie in Bourg-Blanc. Located in the middle of the Finistère, the farthest north-western region in France, the store was in a deplorable state and needed lots of elbow grease; not just anyone would have had the heart to put so much love into an old boutique. But Olivier and Christine, who train regularly for marathons, are not just anyone - they are movers and shakers. 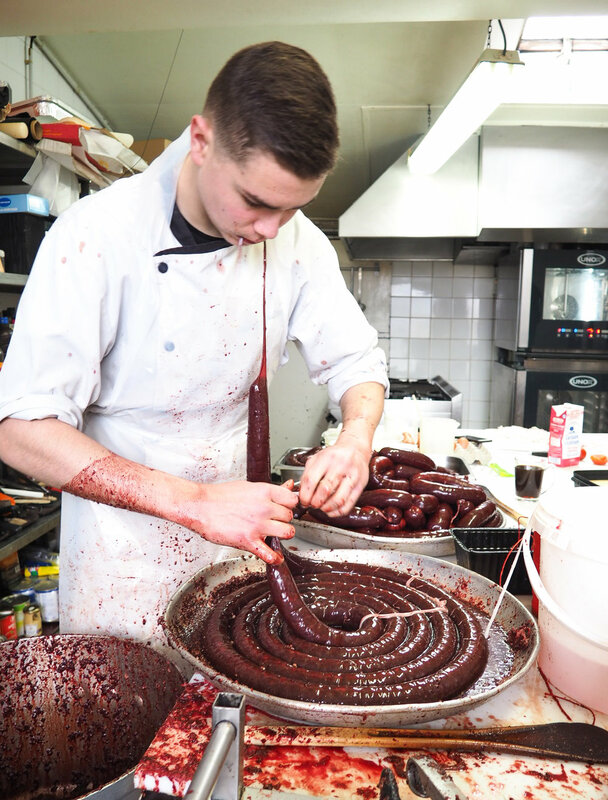 The majority of their products have won prizes; his blood sausage is one of the best we've ever tried, with subtle notes of nutmeg, and his cured ham is traditional to a T, made in the old ham presses of yesteryear. Olivier starts each day at 5:30 am by loading up their truck with fresh goods to be driven by Christine to Brest, where they have their second store. He then jumps into the kitchen and starts on his task list. When we arrived at 8am, he had already banged out quite a few delicious dishes, such as house-smoked salmon toasts, homemade kouign amann, scallops and mushrooms in puff pastry. Not only does a charcutier cook pork items, they are also often the local lunch stop, and catering company. Olivier warmly welcomed and introduced us to his right-hand man, Jérôme, as well as Florian and his apprentice Keyvan. The men were clearly thrown off to have me in the kitchen and jokingly stated that I was, indeed, the only lady who had ever come to work in the kitchen with them. That didn't stop them from making all their dirty jokes! They particularly enjoyed when I learned to make sausages and were often intimidated by the fact that I learned quickly. I am a butcher's granddaughter, after all! It's in my blood. How generous! 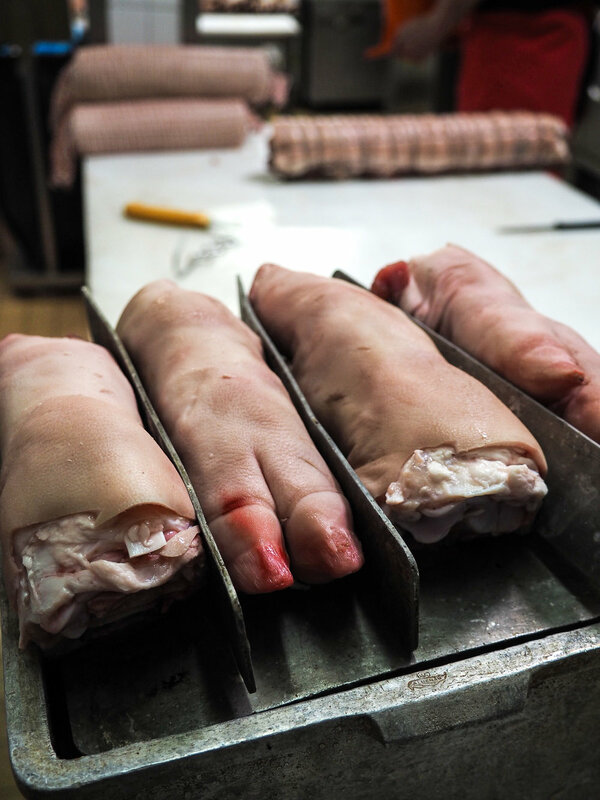 We spent four days with the team and learned all the basics of French charcuterie. The team were very patient with us and clearly enjoyed being able to teach us all the riches of their profession. French Ham "3 noix" : The ham must include all three parts of the rump. The bones are removed, as well as the silver skin and tendons. Then injected with saline solution and packed into ham presses, then cooked overnight at low temperature. This is the recipe of a European Ham Champion! Blood Sausage : the blood, fat, and spices heated and mixed by hand. Again, a prize-winner - the International Blood Sausage Competition. No wonder he sells more than 50 kg per week. Andouille : a smoked intestine sausage. Each intestine must be washed, the inside lining thoroughly scraped out, strung up and seasoned with salt, pepper and mustard. Then covered with a horse intestine. The sausage is then smoked for 12 hours, reducing the sausage to one fourth of it's original size. Andouillette : not to be confused with Louisiana andouillette! This ain't a spicy sausage. No, sir! This is also an intestine sausage, the morsels of more cartilage intestine cut into small pieces and packed into intestine. You'll know it when you smell it! Quite a lot of people like this sausage, served with a strong red wine and kicky Dijon mustard. I, myself, am not a fan. Kig ha farz : Olivier is proud of his Breton heritage and showed me how to make a typical Finistère dish, the kig ha farz. This meat and vegetable pot-au-feu is paired with the farz, which is a boiled buckwheat mixture and often the traditional white flour crêpe mixture. By boiling the batter mixtures, it makes a sort of cake, which is then cut into slices and served with the boiled meats and vegetables. Olivier and Jérôme also showed us how to make the marinated pig's trotters and their special seaweed sausage. Each day we spent with the team was full of new lessons and many laughs. Olivier sure knows how to create a joyful ambiance in his kitchen. For lunch, we were given carte blanche and were offered plates to fill with anything from the store counter. My favorite - his pâté Breton - a mixture of liver, onion, and lots of love, was always on my plate. If you ever have the chance to visit the Finistère region, either in Bourg-Blanc or Brest, you must pass by the store and try Olivier and Christine's specialties. And tell Olivier we say hello! Olivier Hélibert fait partie de ces personnes qui savent très tôt ce qu’ils veulent faire dans la vie et pour Olivier c’est dès l’âge de trois ans qu’il a su qu’il serait cuiseur de chair…un charcutier, un vrai! Il passe son CAP charcutier, à Brest en 1988, se forme au côté de ses paires, et puis se dirige un peu vers la cuisine, donne des cours, mais sa passion première le rattrape. Bien vite et il décide à 28 ans d’ouvrir sa propre charcuterie. A force de travail et de concours il en fait une des charcuteries les plus réputées de France. La majorité de ses produits ont été primés, son boudin est l’un des meilleurs que j’ai pu gouter et son jambon blanc à un fort goût de reviens-y ! Olivier commence sa journée à 5h30 il charge son camion pour la boutique de Brest tenue par sa femme et se met aux fourneaux. Autant vous dire que lorsque nous arrivons à 8H cela fait un bout de temps que l’équipe est au travail ! Olivier nous accueille comme si nous faisions parti de l’équipe ! Il nous présente à Jérôme son second, Florian, et son apprentis Keyvan, et nous met à l’aise très rapidement. « Dites moi ce que vous voulez voir, ce que vous voulez apprendre, je partage tout, les recettes et le savoir faire ! » Quelle générosité ! Nous passons quatre jours à leurs côtés à apprendre les bases de la charcuterie. Le jambon 3 noix : semelle, dessus de tranche et noix pâtissière, désossées moulées avant d’être cuit avec amour c’est la recette d’un champion d’Europe ! Le boudin : à la main avec un gras qui fond dans la bouche et assaisonné avec justesse! (Concours international du boudin) pas étonnant qu’il en passe 50kg par semaine. Il montrera même à Lise comment faire le « kig ha farz, » spécialité Bretonne par excellence ! Nous faisons le tour des produits traditionnels de la charcuterie française et bretonne ainsi que les créations d’Olivier telle que la délicieuse saucisse aux algues. Nous avons passé quatre jours enrichissants, découvrant les coulisses d’un métier que nous ne connaissons qu’en tant que consommateur et nous avons appris énormément au côté d’Olivier et de son équipe. A chaque déjeuner Olivier nous à ouvert les portes de ses frigos et de sa maison pour nous permettre de nous restaurer tous ensemble et j’avoue ne pas avoir pu m’empêcher d’accompagner chacun de ces déjeuners d’un pâté breton ! Je comprends mieux pourquoi il court les marathons. Si vous passez à Brest ou à Bourg-Blanc et que vous êtes amateur de bons produits, une seule direction - la charcuterie ! Olivier Hélibert, top 25 charcutiers de France, selon Gault & Millau. Bon Fond a été gracieusement accueilli par Olivier et Christine Hélibert pendant quatre jours pour apprendre plus sur le profession de charcutier. Voici Olivier qui nous explique comment il a commencé dans son profession.